Experience Singapore by night at its best, beginning with a delicious dinner in the heart of Chinatown. 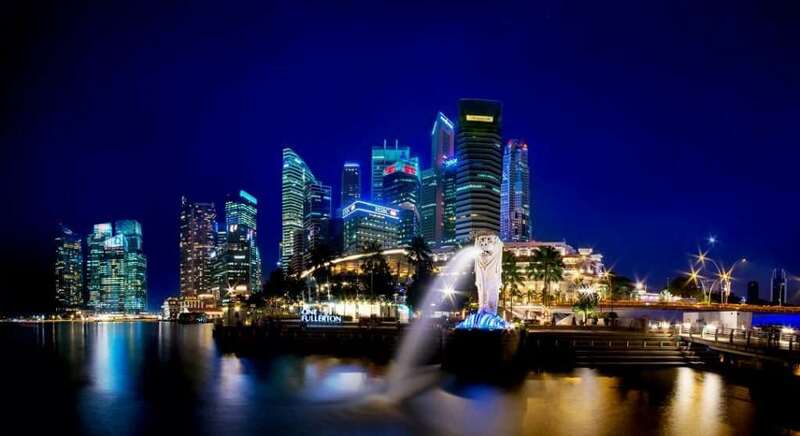 Your Singapore by night tour takes you to the Fountain of Wealth, the world’s largest fountain, where you can take in the beautiful sight of the central business district via Benjamin Sheares Bridge, the longest and tallest bridge in Singapore. Next, stroll to vibrant Bugis Street or other night bazaars during festive period, where your guide will take you for a stroll around the Pasar Malam, otherwise known as the Night Market. Your last stop on your Singapore night tour will be at Smoke & Mirrors for a taste of Singapore’s very own and highly potent concoction, the Singapore Sling. Please note, dinner will be at passengers’ own expense if taking the Singapore by Night tour excluding dinner. Please also note, this tour will operate as a private group for Distant Journeys guests, based on a minimum of 15 passengers. If the minimum number is not reached the tour can be booked on a seat in coach basis with other travellers. The cost of this will be $88SGD and includes a communal style Chinese dinner.